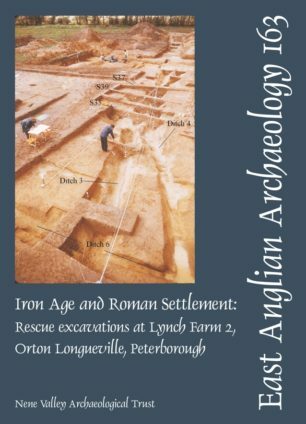 Excavations at the Lynch Farm 2 site were the second in a series of three major excavations carried out in a meander of the River Nene, to the west of Peterborough, during the early 1970s. The area within the meander showed aerial photographic evidence of extensive occupation during the prehistoric period and during the Iron Age a multiple ditch system may have marked the area out as a minor oppidum. Part of this ditched system was dug in 1973 by Adrian Challands and is now termed Lynch Farm 1; it remains unpublished. The extensive cropmarks also indicated Roman occupation, including parchmarks of a number of suspected Roman buildings. These cropmarked areas of the site were scheduled for preservation, although gravel working did encroach on one area which contained part of a late Roman cemetery; this was dug in 1972 by Rick Jones, is now termed Lynch Farm 3 and was published in 1975. The peripheral areas within the meander were thought to lack archaeological significance and thus were deemed suitable for gravel extraction to provide aggregate for the expansion of Greater Peterborough. 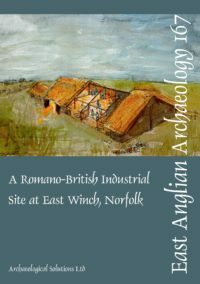 However, once gravel workings started on the eastern part of the meander, unknown Roman buildings began to be found and gravel extraction was partly halted while an archaeological rescue excavation was undertaken. The archaeological work revealed a late Iron Age pit alignment, with one pit containing an adult burial. During the early Roman invasion period a fort was situated over the top of this earlier Iron Age occupation. The fort appeared to be of the same date as the fortress at Longthorpe, some 800m to the east. Once the military had abandoned the site the area within the Lynch Farm fort was immediately occupied by a small enclosure set within the south-west corner of the rampart. In the 2nd century an aisled building was constructed within which were furnaces used possibly for salt extraction. This building was later demolished and a larger aisled building was built on the same site, although with a different alignment. By the late 3rd/early 4th century ditches and pits were being dug for drainage purposes and other buildings constructed, including a small Romano-Celtic shrine. Two wells were also dug. Occupation at the site continued until the late 4th century, when the site underwent a demolition and clearance phase associated with late surfaces and site reorganisation. The Roman occupation at Lynch Farm 2 forms what appears to be a small part of a much larger Roman settlement seen only on air photographs. This consists of scattered buildings arranged over an area 800m wide and is unlike most local villa or farmstead establishments, although a growing number of parallels for such settlements are now being added to the literature.